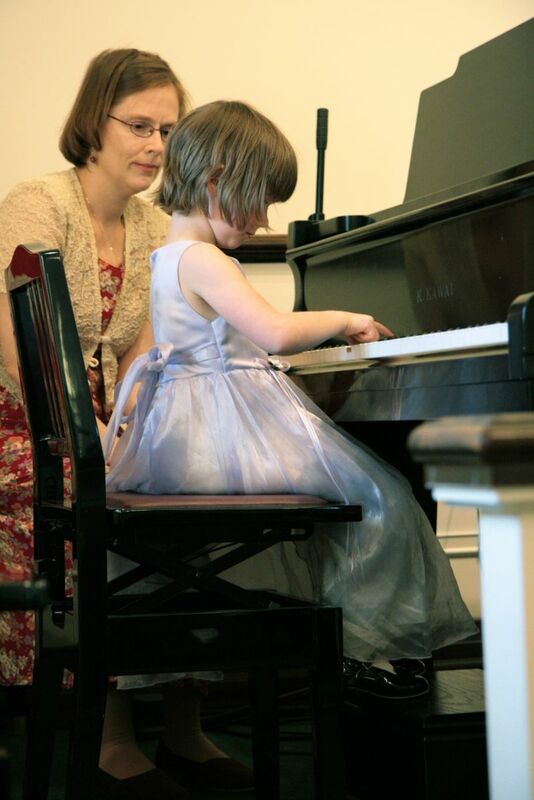 Young or old, Everyone can benefit from studying Suzuki piano. I'm an Adult. Am I Too Old for Lessons? 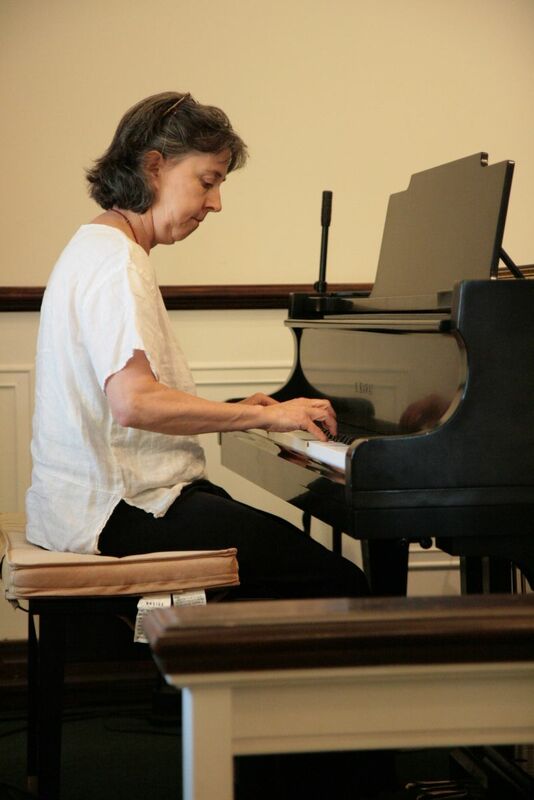 Contrary to popular thought, it is never too late to start Suzuki music training: Adults who always wanted to study music thrive on the Suzuki Piano Basics approach. 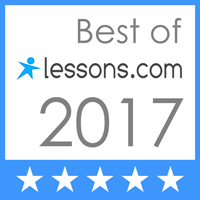 Every year, several of our students are adults who did not study music before, or who were taught the disastrous F-A-C-E and Every Good Boy Does Fine method...and consequently felt like musical failures. The adults in our program are thriving and making rapid progress in their music studies, now that they are trying the native-language approach. Is My Child Too Young for Lessons? Science shows us that babies are musical even in the womb. They can react positively or negatively to sound inputs. They show greater interest in unfamiliar music and language, paying close attention; and they show inattentiveness, sleepiness, or contentment with familiar music and language. In recent years, scientific researchers have been using heart rates and physical movements to monitor babies' reactions to familiar and unfamiliar sounds, music, and language. The results are fascinating! So, perhaps it should be no surprise that babies can begin learning music from birth. 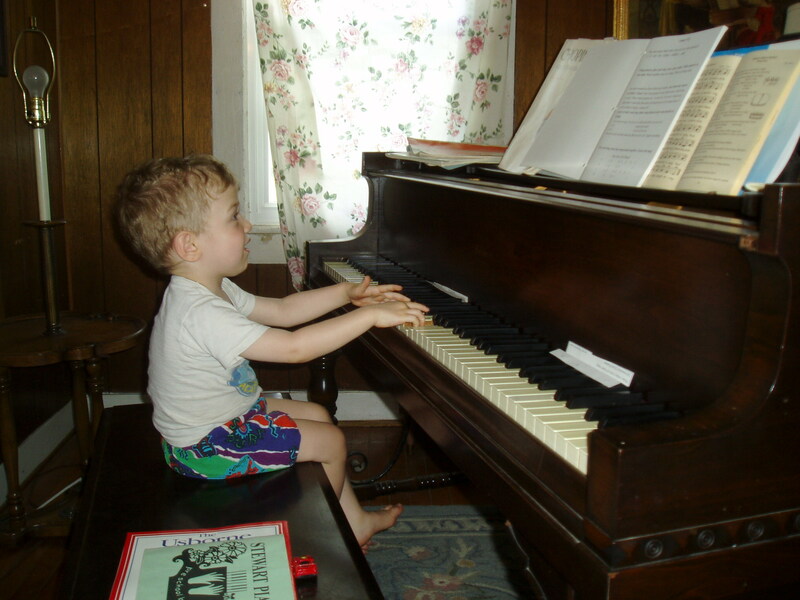 Most children are ready to begin formal study of piano at 2 years old, in Mommy-&-Me or Daddy-&-Me lessons. And they are ready to begin preparatory studies at age 1 or 2. The parents' participation is vital at these young ages, because parents are the child's role models. Whatever they see the parents doing, is what they will want to do, too! Younger siblings of Suzuki students are often ready to begin very early, because they have been listening to the CD's and attending their older brother or sister's lessons for a year or more. What about 9 months old? Does that number surprise you? 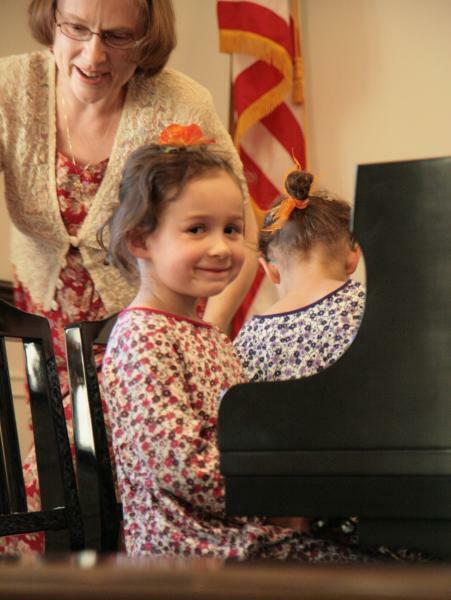 Yes, it is possible for children to begin learning piano very early! If the parent is willing to take lessons first, and provide the example and environment that most naturally raises a musical child, then a child can begin learning from a very early age — even as a newborn. For newborns and babies, we start out by playing singing and movement games with the children and their parents. These very young children learn to vocalize on pitch, imitate our sounds, move in rhythm, and many other early-development skills. This stage is so important in a child's life! As the child begins to reach and grasp objects, then the child is ready for early motor-skills development. Using toys and activities, we develop the child's natural responses so that learning to play the piano with proper technique will be instinctual. 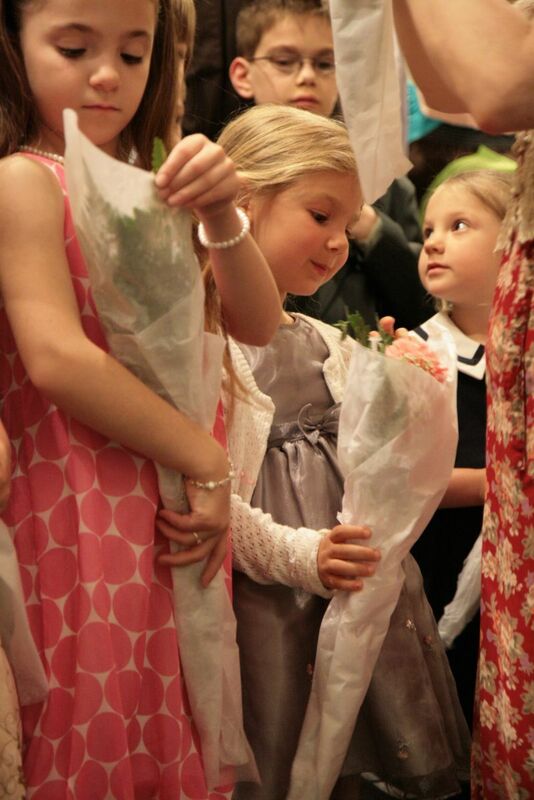 Likewise, we use their increasing mobility to teach them skills that will be useful in piano and singing. Around the time they begin walking, at about age 1, we can begin formal training of the child. We use games and activities that are fun for the child, to build finger dexterity, rhythm, singing voice, and pitch recognition. At this age, we do not expect them to play already-composed pieces yet, but they can improvise and imitate. It is important for the parent to continue learning piano and singing during this time, and to realize that most of the lesson time will continue to be focused on the parent. This is because young children will desire to study the piano if they think they are copying Mommy or Daddy. Dr. Suzuki was very smart to figure this out! Important: All children are musical, and all children will be accepted into the program. No one is ever turned away, because EVERYONE can learn to play music. I have never seen a student fail, and I never will. Everyone succeeds if they have a positive attitude, and if they are willing to work hard. It is my job to ensure their success. How Can I Prepare My Baby or Toddler for Lessons? Parent can prepare a young child for music lessons by providing a fun and informal beginning to musicianship studies. The best way to do this is through musical play — which can be done through our classes for children ages 0-2, or done at home by the parents. The important thing is to give the children lots of exposure to movement, singing, musical instruments, and games. Young children live in a world of the senses, so interact with your children through rhyme, singing games, movement and simple percussion play, providing an excellent foundation for more formal music studies in the future. Listening to Suzuki piano CDs by Dr. Haruko Kataoka during playtime is an excellent and joyful way to instill in your child what good piano playing should sound like. When children go to the piano to make sound, they will try to imitate Dr. Kataoka's beautiful tone. The same is true of early singing training: the youngest students imitate the relaxed sound of proper singing technique almost effortlessly. By starting singing training early, a student avoids awkwardness and artificial habits that can damage the voice or convince a child that they have no "talent." All children have talent — it just needs to be developed! Young children will also imitate the examples of other musicians in their households. Look at the child in the picture here. He is only 2.5 years old, but look how well he imitates his mother, brother, and sister, who all play piano: His hands are nicely curved, he is playing the piano keys carefully and beautifully, and he is looking at the written music with an understanding that those black dots are for making music. His family has also taught him that practicing the piano is fun: Look at the joyful expression on his face. Parents are a child's most important music teachers. Parents don't need to be musical themselves, though taking lessons alongside a young child can be very helpful. In any case, the best thing you can do to help your child learn music is to be enthusiastic about music and willing to be involved in guiding your child in a spirit of fun, praise and encouragement. A loving emotional bond between parent and child is the most powerful motivator. Children learn music much the same way they learn language. They absorb beat, rhythm and melody from the models around them, which might be other children, adults, games, radio, CDs, etc. The earliest years of a child's life are especially exciting, as this is when children are best able to 'catch' the musical nuances of great artists. By providing children with the greatest examples of recorded and live music — e.g., classical, opera, world music--parents are able to nurture children's heightened musical sensitivities.